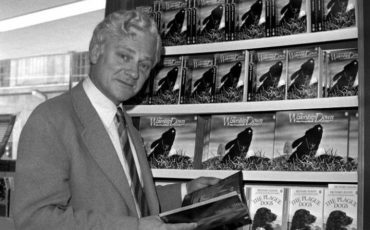 Richard Adams in the mid 1970s upon publication of Watership Down. Richard Adams (1920-2016) interviewed in 1978 by Richard Wolinsky. On the second anniversary of his death, and with a new version of “Watership Down” airing on Netflix, a look back at the life and career of Richard Adams. 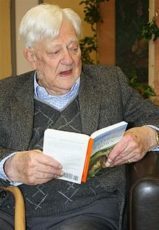 Richard Adams, the author of “Watership Down,” “Plague Dogs” “Shardik” and other novels, died on Christmas Eve, 2016 at the age of 96. Born in 1920, he served as a liaison officer during World War II, and later joined the civil service, rising to the rank of Assistant Secretary to the Ministry of Housing. Past the age of fifty and a life-long civil servant, Richard Adams began telling stories to his daughters about talking rabbits while on a car trip. The daughters prompted him to turn the stories into a novel. After four failed attempts, a fifth try in 1972 found a publisher and “Watership Down” became an international best-seller and later a beloved classic fantasy. It was on tour for that third novel upon its American publication in the spring of 1978 that Richard Wolinsky interviewed Richard Adams. Though he’d conducted a handful of interviews with a co-host, this was Richard Wolinsky’s first solo shot in what would be a long career as literary interviewer. Though Adams continued to write well into the 21st Century and would publish fourteen more books , he never again achieved the success of his first few novels, especially of course Watership Down. Watership Down and The Plague Dogs both became animated films; a live action film of another novel. The Giril in a Swing, was released in 1988. Watership Down also became a 39 episode TV series in from 1999 to 2001. A new mini-series of Watership Down from BBC One began airing this week on Netflix, featuring the voices of James McAvoy, Ben Kingsley, Nicholas Hoult and John Boyega. Also: A review of Dear Evan Hansen, at the Curran Theatre in San Francisco through December 30, 2018.